The soccer teams were changing throughout the years. The players were some for many years, others for certain years only: Eugen Poklar, Toni Zanetič, Darry Maddison, Vince Bordonaro, Darko Hribernik, Milan Kneževič, Stanko Gregorič, Robert Stolfa, Maks Vojvoda, Mark Sušelj, Alex Rosič, Drago Kričkič, Livio Mingot, Edi Vitez, Michael Lesnik, Viktor Valenčič, Joe Vadnal and Stanko Iskra. Some players were of different nationalities. The coaching (and assisting) was by Drago Vlah, George ?, Dino Rupnik, Anton Poklar, Alojz Stolfa, Alojz Kumar, Lado Lipec, Darry Maddison, Milan Kneževič. 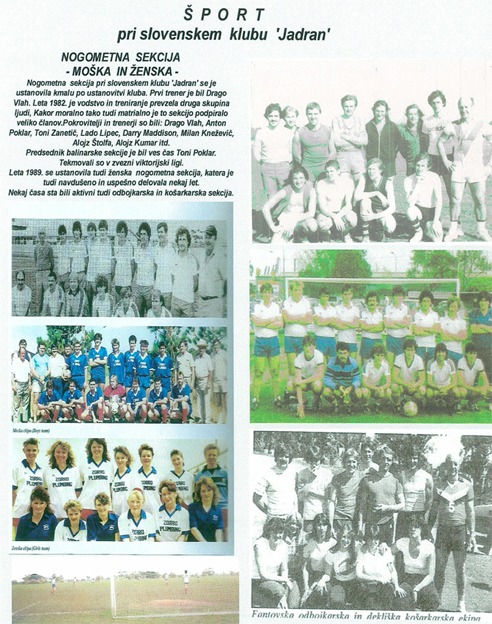 The Jadran Club Soccer Team president was Anton Poklar. Ana Poklar took care for clean and tidy uniform all the years. Mens’ team was active cca 10 years and the Ladies’ cca 3 years only. Not just young men, but ladies had their own soccer team as well.